Conference Series Ltd invites all the participants across the globe to attend 3rd International Conference on Electrochemistry Berlin, Germany. Dr. Pablo Fanjul Bolado, Ph.D in Chemistry by the University of Oviedo (Spain), co-founder and R&D Director of DropSens company has a broad experience dealing with Electroanalytical devices and (bio)sensors. He has focused his research in the design, development and characterization of screen printed electrodes as transducers for biosensing applications in clinical, agri-food or environmental sectors. Working with carbon, gold, platinum and silver electrode surfaces in combination with nanomaterials, he has developed portable analytical solutions to carry out ‘in situ’ measurements in Batch and Flow Injection Analysis systems. Pablo has a great experience in technology transfer from the lab to the market and as entrepreneur, he is encouraged to provide new hyphenated analytical instrumentation to solve analytical problems. UV-VIS, NIR and Raman Spectroelectrochemistry techniques can be used as ‘in situ’ and real time characterization and quantification techniques. These are powerful techniques since more complete and specific information is obtained with optical and electrochemical signals recorded simultaneously. However, the main current disadvantages are related to complex experimental setup where two analytical instruments (spectrometer and potentiostat) controlled by two different software should be triggered and usually a home-made spectroelectrochemical cell is used [1-3]. The purpose of this study is to introduce a new compact and portable Raman spectroelectrochemical instrument controlled by one software in combination with screen printed electrodes. The new instrument integrates a 785 nm laser, a Raman spectrometer and a potentiostat/galvanostat fully synchronized in the same box. A Raman probe and a Raman spectroelectrochemical cell are used under optimized conditions together with Screen Printed Electrodes (SPEs). These miniaturized strips where the three electrodes of the electrochemical cell are printed together in the same alumina substrate are easy to handle, do not need to be pretreated previously to be used and require a low volume of solution (around 40 μl) [4-5]. Time resolved and quantitative measurements were developed on SPEs using different molecules such as ferricyanide, ruthenium bipyridine, thionine or the active pharmaceutical ingredient called naratriptan. 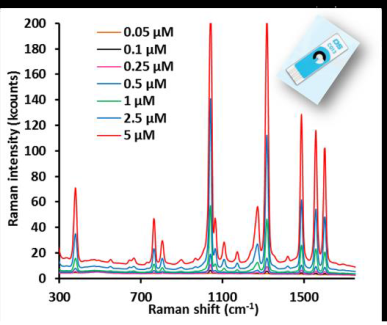 On the other hand, silver, gold and copper based SPEs are shown as cost effective Surface Enhanced Raman Spectroscopy (SERS) substrates. The complete experimental setup is demonstrated to be easy to handle in comparison to the use of conventional electrodes and allows fast, in situ, real time and time resolved Raman Spectroelectrochemical measurements. Sefik Suzer has completed his PhD in 1976 from the University of California, Berkeley, USA. After postdoctoral studies at Sydney (Australia) and Freiburg (Germany) Universities, he joined Middle East Technical University in Turkey in 1979 till he moved to Bilkent University in 1992. He has been serving as Editorial Board Memeber of Journal of Electron Spectroscopy, Applied Surface Scince, Spectroscopy and Dynamics, and as an Editor of Surface Scince Reports, and he is s Fellow of the American Vacuum Scince since 2010. X-ray photoelectron spectroscopy (XPS), a chemical analysis tool, is utilized for investigation of charge screening across metal electrodes fabricated on a porous polymer surface which is infused with an ionic liquid (IL). The IL provides a sheet of conducting layer to the otherwise insulating polymer film, and enables monitoring charging and screening dynamics at the polymer + IL / air interface in a laterally resolved fashion across the electrodes. Time-resolved measurements are also implemented by recording several peaks of the IL, while imposing 10-3 to 10+3 Hz square-wave-pulses (SQW) across the electrodes in a source-drain geometry. Variations in the binding energy of the measured peaks (Au4f, C1s, N1s and F1s) reflects directly the local electrical potential, and allow us visualize screening of the otherwise built-in local voltage drop on and across the electrodes. Accordingly, the device is partitioned into two oppositely polarized regions, each following the polarization of one electrode through the IL medium. Impact of our findings with the presented structure and variants XPS measurements on understanding of various electrochemical concepts will be discussed.